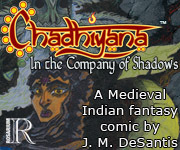 24 pages of Chadhiyana: In the Company of Shadows are available as a free preview of the series, now a bi-monthly comic from Rosarium Publishing! In the Company of Shadows - "Page 1"
Hark’n, my ranee, my queen, for I speake of that part of th’ Songe of th’ Sacr’d Fire which touch’th most closely to thine heart. Know that it is impossible to tell th’ tale of th’ First Flame and not recount’th th’ legends of Chadhiyana, strong’st and most beautiful of all th’ women who have e’er walkt b’neath th’ heav’nly sky, save my ranee, Gujrapee, alone, her rav’n hair soft as silke, her brown eyes deep wells of wisdom, her red heart fill’d with boundless love and kindness. She rivals in e’ery waye e’en th’ twelve Englari who are near’st th’ One. I am too bolde! If in speaking so my wordes have offend’d thee, my raja, my king, I beg thou leave my head where it sitt’th but longe enough for my tale to be tolde, that Ranee Gujrapee might hear’th that which she command’d me compose. Hear and judge. 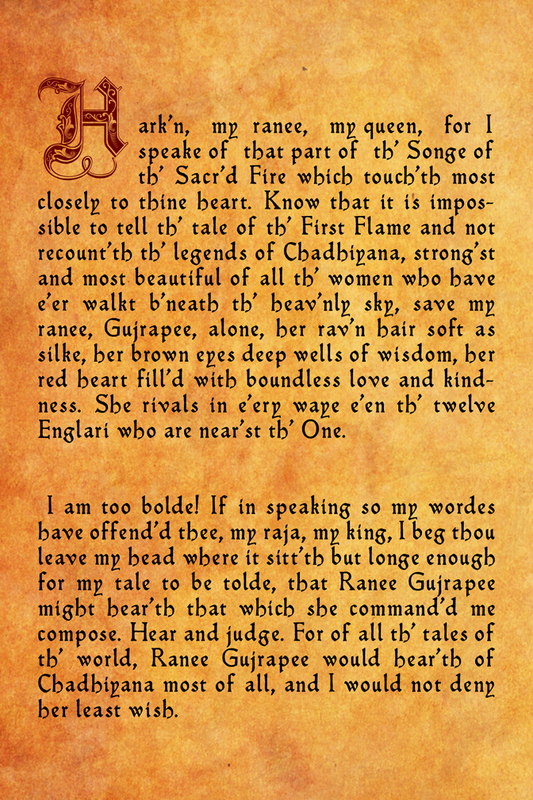 For of all th’ tales of th’ world, Ranee Gujrapee would hear’th of Chadhiyana most of all, and I would not deny her least wish. Harken, my ranee, my queen, for I speak of that part of the Song of the Sacred Fire which touches most closely to thine heart. 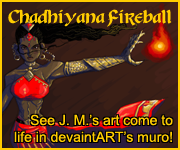 Know that it is impossible to tell the tale of the First Flame and not recount the legends of Chadhiyana, strongest and most beautiful of all th’ women who have e’er walked beneath the heavenly sky, save my ranee, Gujrapee, alone, her raven hair soft as silk, her brown eyes deep wells of wisdom, her red heart filled with boundless love and kindness. She rivals in every way even the twelve Englari who are nearest the One. I am too bold! If in speaking so my words have offended thee, my raja, my king, I beg thou leave my head where it sit but long enough for my tale to be told, that Ranee Gujrapee might hear that which she commanded me compose. Hear and judge. For of all the tales of the world, Ranee Gujrapee would hear of Chadhiyana most of all, and I would not deny her least wish.